Dozens of Seminole homes and businesses were damaged Friday afternoon when a band of intense storms moved through the Tampa Bay area. 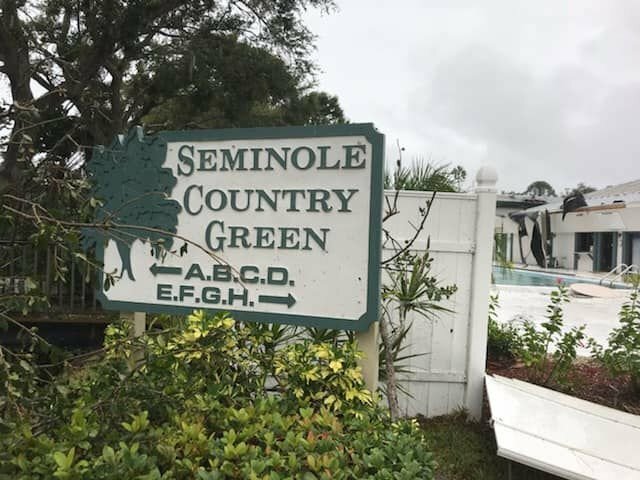 In Seminole, the majority of the damage was concentrated in two places: an area just off Park Boulevard and Starkey Road at 91st Street and 76th Avenue, and the Holiday Village Mobile Home Park on Seminole Boulevard. 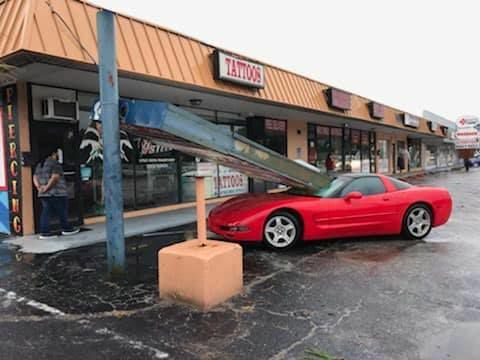 SEMINOLE – Dozens of Seminole homes and businesses were damaged Friday afternoon when a band of intense storms moved through the Tampa Bay area. A tornado touched down in Seminole just after 3 p.m., said Seminole Fire Rescue Chief Heather Burford. Earlier, the storm system also produced tornadoes in Spring Hill in Hernando County and New Port Richey in Pasco County. In Seminole, the majority of the damage caused by the tornado is concentrated in two places, she added: an area just off Park Boulevard and Starkey Road at 91st Street and 76th Avenue, and the Holiday Village Mobile Home Park on Seminole Boulevard. The tornado appears to have initially touched down in the area of the mobile home park and headed east across the bayou and Lake Seminole Park, Burford said. “It definitely looks like it created a path,” she said. Bryan Mroczka, a meteorologist with the National Weather Service’s Tampa Bay office, said the tornado, which was moving at 50 to 60 miles per hour, had multiple touchdowns in Seminole. The tornado caused structural damage to a number of businesses, and single-family and mobile homes, Burford said. It also tore down power lines, leaving many without electricity, and uprooted trees. Seminole Fire Rescue, Seminole Public Works Department, Lealman Fire Rescue, Clearwater Fire & Rescue, Pinellas Park Fire Department, the Pinellas County Sheriff’s Office, Pinellas County Emergency Management and Pinellas County Public Works responded to the scene. Duke Energy worked into Saturday morning to restore power for residents. There were no injuries, Burford said, just one medical-related call for someone suffering from high blood pressure. Joe Davison, who lives on 64th Avenue, said the tornado hit with no warning. His home had some structural damage on one side, he said. Other neighbors had roofs “trashed.” He also saw the tornado pick up a gazebo from one neighbor’s backyard and drop it on the front yard of another neighbor across the street. Another neighbor, after it hit, found a roof in his front yard, he said. “It’s not his roof. He doesn’t even know whose roof it is,” Davison said. Though he didn’t lose power, all of his neighbors on the opposite side of the block were without power after the tornado hit, he said. Logan Mosby George, editor of the Clearwater Beacon, was at Starkey Elementary School for a parent-teacher conference when she received an emergency alert on her phone. School had already been dismissed for the day, but there were still many teachers at the school. After the emergency alerts came through, school officials immediately brought all children who were still on campus waiting outside for rides back into the building, “and everyone was told to stay put,” George said. Power briefly went out at the school, she added. After she left, she saw police vehicles moving toward the Park Boulevard and Starkey Road intersection, and “traffic was backed up considerably,” she said. George, originally from Mississippi, said she wasn’t worried about the tornado warning, though. “I grew up with tornadoes, so I wasn’t fazed at all,” she said. Clearwater resident Patricia Marker was visiting a condo complex on Seminole Boulevard when the tornado hit. “Then all the lights flickered and then went out,” she wrote in a Facebook message to the Beacon. She left after the wind and rain slowed down. Download and print out TBN's April coupons to cash in on deals from your local businesses. Tampa Bay Newspapers' annual special section highlights the best shopping, dining, arts, history and cultural events in the county.